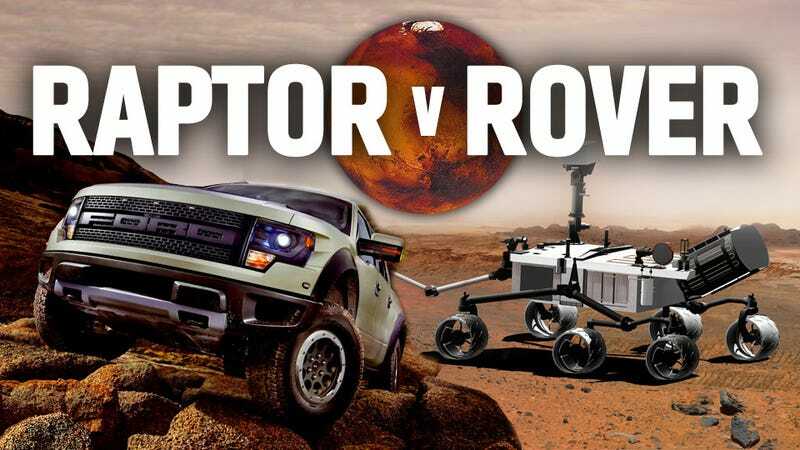 Ford has released this very helpful guide comparing the new 2013 Ford Raptor to the 2012 model NASA Curiosity Mars Rover, for those of you comparison shopping. Both are impressive vehicles, and this nice, tall-format chart really takes the guesswork out of a complex evaluation. I suspect most buyers in the Earth-centered market will opt for the Raptor, since it's about $2,499,956,030 less than the Mars rover, and the inventory of the Mars rovers is a bit thin, the only example being about 352 million miles away. The chart reveals a number of other interesting facts as well. Did you know that Curiosity actually has a bit more torque than the Raptor? Curiosity gets about 500 lb/ft per wheel from its nuclear-powered electric motor to the Ford's 434 lb-ft from its beefy 6.2L V8. The Ford has distinct advantages from a utility and comfort standpoint, being the only one of the two actually able to accomodate human beings. Curiosity does have the advantage on Mars, since unlike the Raptor, it can function at all. Man, this is a tough one. Curiosity will be landing on Mars this Sunday, so you better make your mind up quickly.